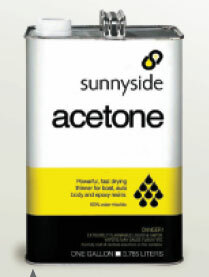 Michigan Toy Soldier Company : Sunnyside - Acetone 16 oz. Powerful, fast-drying solvent that is effective for epoxies, vinyl, lacquers, contact cements, plastics, adhesives, and polyester resins. It is also used as a metal cleaner prior to painting.